Rihanna nearly crashed the internet with the launch of her new make-up line, Fenty Beauty in September in 2017. Now Fenty Beauty has been named one of TIME‘s 25 Best Inventions of 2017. 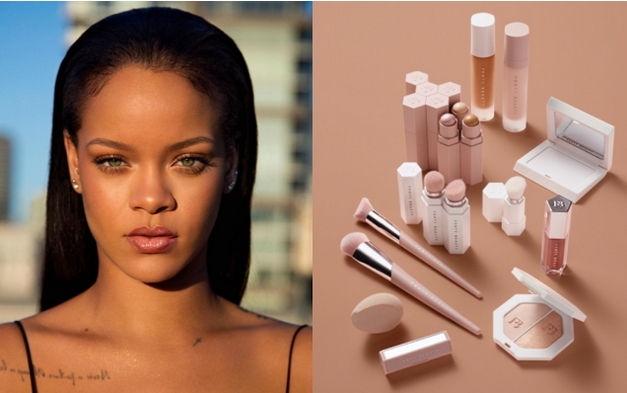 Alongside innovations such as Halo Top and the iPhone X, Time lauded Fenty, especially giving props to the brand's wide range of foundation shades. As TIME's reporter Cady Lang wrote, "Makeup companies often cater to women with light to medium skin tones, both in products and advertising, and sideline women of color. Not so with Rihanna's line." Lang also noted how Fenty's deeper shades of Pro Filt'r Soft Matte Longwear Foundation ($34) sold out like crazy, which sent a strong message to other up-and-coming makeup lines: representation matters. The music star took to Twitter to share excitement. "I'm so honored and I have to send love to everyone who's supported this brand in the 2 months that we've been here! Glory to the Most High," she wrote. Rihanna told TIME, “I never could have anticipated the emotional connection that women are having with the products and the brand as a whole. Some are finding their shade of foundation for the first time, getting emotional at the counter. That’s something I will never get over”.